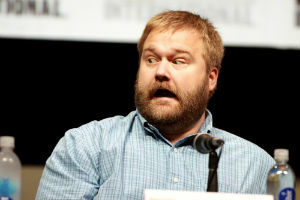 These days, Robert Kirkman is keeping himself very busy â€“ particularly on the TV front. In addition to his "Walking Dead" franchise work and the upcoming "Outcast" series not to mention some movie work here and there, Kirkman is also getting into the streaming market. Kirkman has sold a new series titled "Five Year" to the streaming service Viki. The series, a co-production between his Skybound Entertainment and Viki, is being described as "an apocalyptic action thriller mixed with a Korean drama." This doesn't sound like too much of a stretch for Kirkman who obviously has a passion for the apocalyptic and for intimate stories told in apocalyptic settings. As for the Korean drama angle... not sure if that was part of the original pitch or something that was added specifically for Viki; the streaming service specializes in international content notably Korean dramas, Japanese anime and Bollywood films. It'll be interesting to see if Kirkman adds "Five Year" to his writing and showrunning gig or if he brings on a protÃ©gÃ© to handle the show. It's early days still but it will be interesting to see how this project develops.